The Extras Arent Extra at DR Htls. Your grt rate inclds FREE Hot Food and Cold Beverages at our 5.30 Kickback/FREE Hot Bkfst/FREE Wireless Intr Access and FREE Long Distance. Our 5.30 Kickback inclds a rotating menu of chicken tenders/meatballs/baked potatoes/soup/salad/beer/wine/soda/mixed drinks and more-sub to state and local laws-. Dont miss our grt Free Hot Bkfst Buffet with/sausage/Belgian waffles/biscuits and gravy/fresh fruit/bagels and pastries. Take advantage of FREE popcorn and soda every evening from 3-10p.m as well as our complimentary exerciserm/and 24 hr buss ctr. Cme visit us in San Antonio. 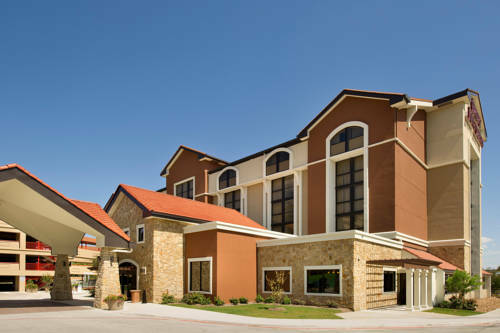 The Htl is conveniently located at Loop 410 and Jones Maltsberger. This Htl offers 284 std gstrooms and two-rm stes. The stes provide a relaxing atmosphere/which incld separate bedrms and living areas. Our focus is ensuring that our gsts get more for their dollar than at our competitors. Family ownership makes DR Htls distinctly different by providing a consistent experience at more than 130 Htls. For eleven consecutive yrs J.D. Power has recognized DR Htls with the award for Highest in Gst Satisfaction Among Mid-Scale Htl Chains. Cme stay with family at DR Htls. Misc Info- Free QkStart Bkfst served dly-Free Evening Food Favorites-Free light evening meal-served Mon-Thur 5.30pm-7.00pm-Free Evening Beverages served Mon-Thur 5.30pm-7.00pm-Outdr Pl and Whirlpl-Indr Corridor-Elevator-Gst Laundry-In-rm coffee serv-25Inch Cable TV-Free Local Phone Calls One hr of domestic us long distance calls per night-100Pct Satisfaction Guar-free high spd Intr access Awards-AAA Rating-3 Diamond. 1.Fitness Center and Spa * FREE USE OF ON-SITE EXERCISE ROOM INCLUDES EXERCISE BIKE, TREADMILL, ETC.